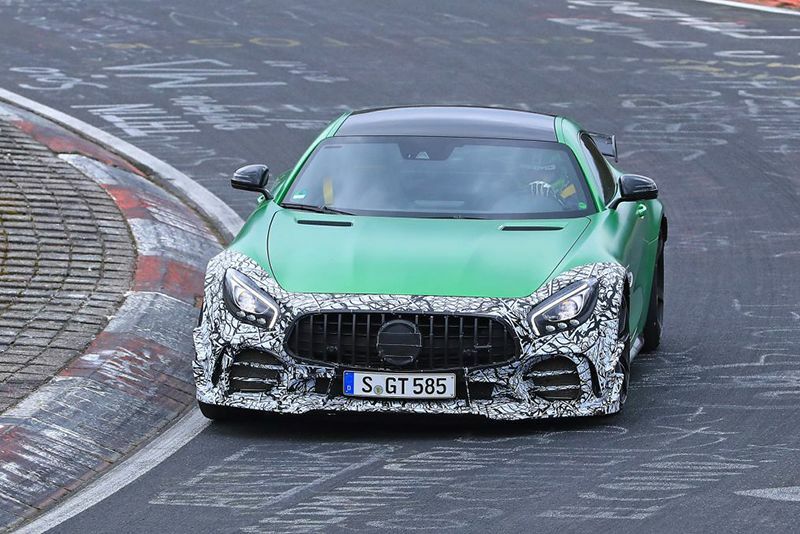 Recently, snaps of a slightly camouflaged Mercedes-AMG GT R smashing laps at the Nürburgring emerged, causing many of us to wonder what it actually is. Well, AMG boss, Tobias Moers, has confirmed that it is a ‘Clubsport’ package to be built alongside the forthcoming Black Series. Apparently, the Clubsport package should mimic the Weissach package available on Porsche’s 911 GT3 RS, which basically means track-focussed performance and aero tweaks. Moers said, "Price-wise and positioning-wise, our GT R is between 911 GT3 and 911 GT3 RS. There’s no official confirmation on its name, despite Moers referring to the car as Clubsport. According to EVO Magazine, 'a Mercedes spokesman denied all knowledge of the vehicle when contacted for clarification'. Back to those snaps though; we see a new front bumper with a much larger splitter including those cool supporting uprights, plus a pair of canards (those little wings on the sides of the front bumpers) mounted on either side of the revised outer intakes. The extra downforce on the front is counterbalanced with a larger rear wing. It's expected that the standard AMG GT R’s M178 4-litre V8 twin-turbo engine will be revised from its current 577bhp to around 600bhp, while the car is likely to weight less too thanks to the use of carbon components among others. With a GT R ‘Black Series’ rumoured to be released in 2020, we suspect this Clubsport model will fill the gap between the Black and the current GT R.
It's guaranteed to be a beast though.